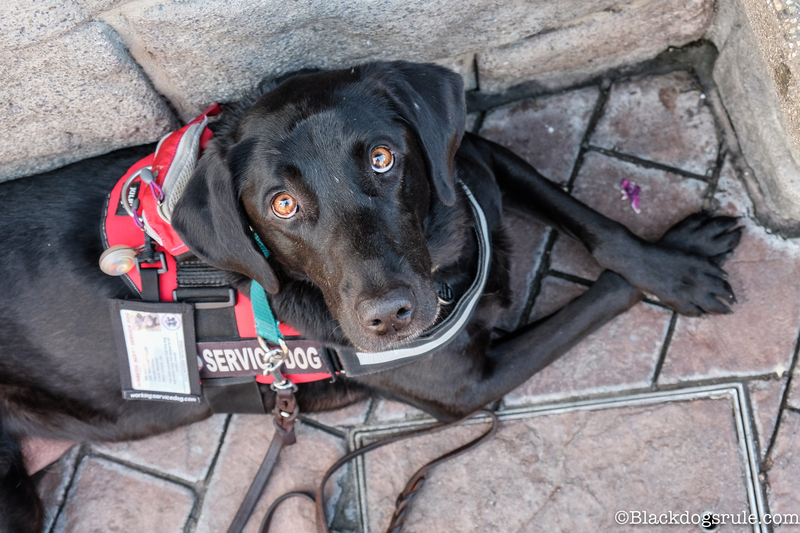 Based on a compliment we received from another SD handler and just how crowded it was yesterday, I realized I have never discussed how important it is or what is meant by protecting your service dog while out in public. For public access work, distractions, obedience, and crowd control work, I can’t imagine there is any place more challenging than Disneyland on a gorgeous Southern California Saturday. 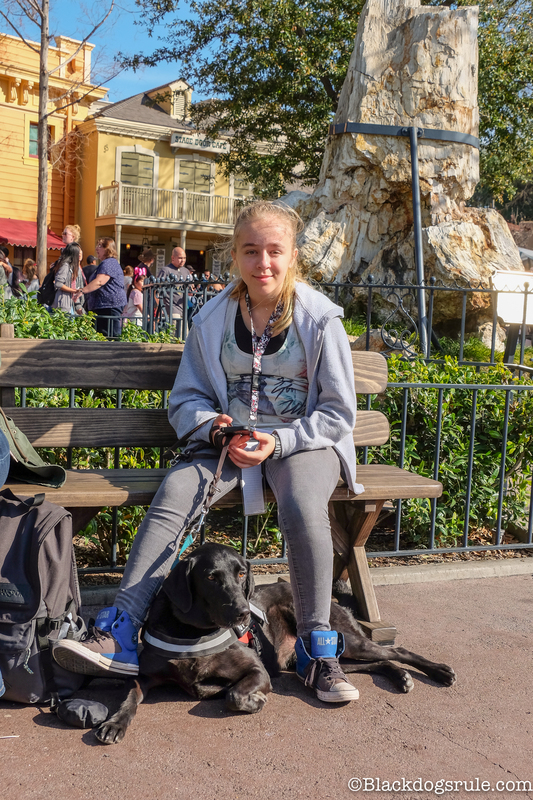 The park was jammed full of guests making it hard enough to traverse the park with kids, let alone a teenager handling a dog. Disneyland is a very visual place. There is so much to see all around you, so you have to keep an eye on everyone. People are looking up and around, and not down at their feet, making your dog a tripping hazard. It is also shoulder to shoulder crowded in some areas. 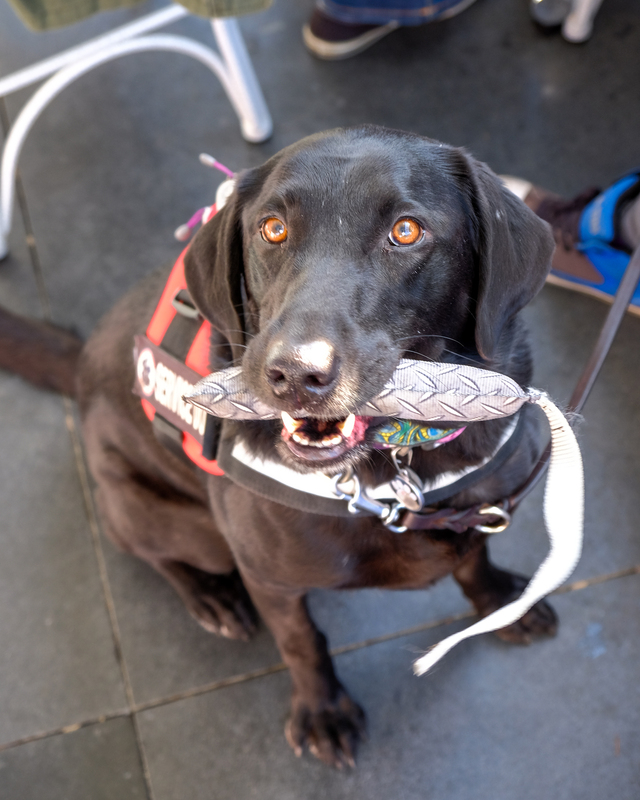 Compound that with a darker colored dog, and it makes it imperative that you take a few precautions when handling to assure the safety of you, your dog, and the other guests. The first thing required is excellent heeling. The dog must be able to stay in a nice tight heel by your side. No wandering off at the end of the leash. At the same time, being able to keep a nice short lead is imperative. There is a serious lack of recognition for personal space at a crowded amusement park (or mall at Christmas time, or Costco on Saturday) so you can’t expect to be granted a 5 foot space bubble around you. People will bump into you, and they won’t see your dog. Having your dog under control at all times is rule #1. This also helps prevent unwanted ground surfing. 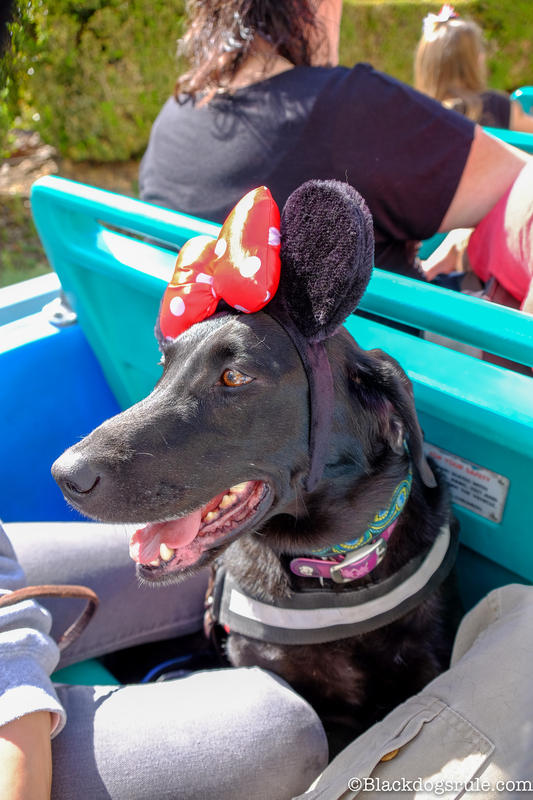 Disney is really good about keeping the park clean, but there is still popcorn, churros and other potentially dangerous things for your dog to try and ingest. And having a dog shoot out to grab a stray food item can create a tripping hazard. working and understanding leave it and good heeling goes a long way to preventing issues. We also like to create a shield or a bubble around the dog whenever possible. 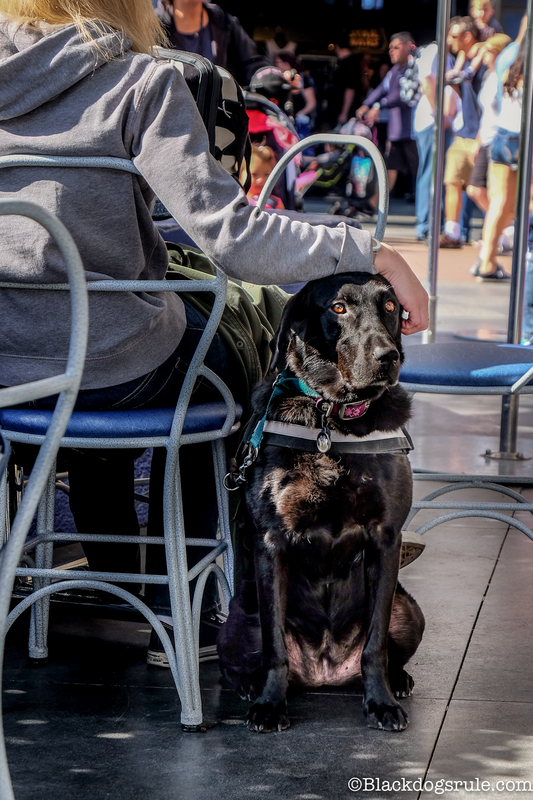 Staying close and surrounding the dog prevents unwanted ninja petting, tripping, or worst of all, bumping from behind with a stroller or dangling purse. When walking through a crowded area, the dog heels on the left. So there is a person to the dog’s right. One of us will walk on the dog’s left. and one of us will stay in back, behind the dog. (this is the most important position. Having something bump into your dog from behind can really spook them) When it gets really tight, we walk single file 1 person infant of and 1 person behind the dog. 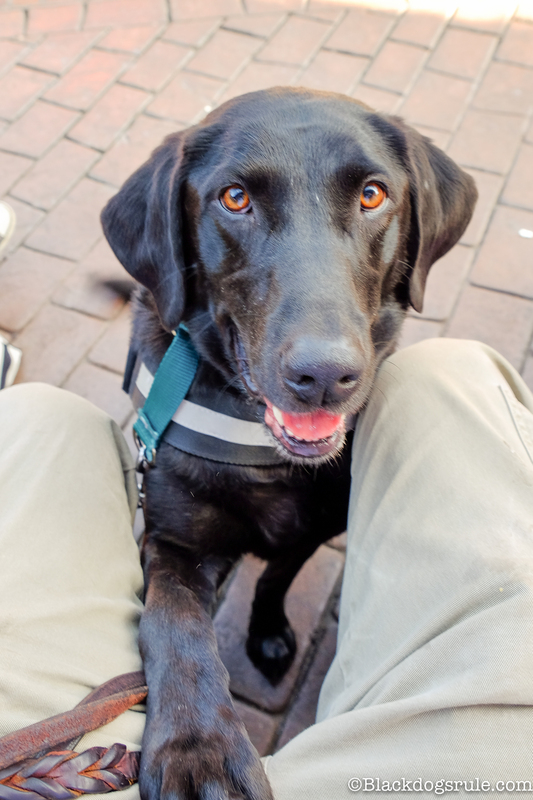 When we are resting for a second, again we try to keep the dog under the bench, or if it is too dirty/narrow/filled with popcorn, at least out of harms way by putting them under our legs so someone would step on us before stepping on the dog. Along with all of this, you also need to think about the dogs needs for the day. 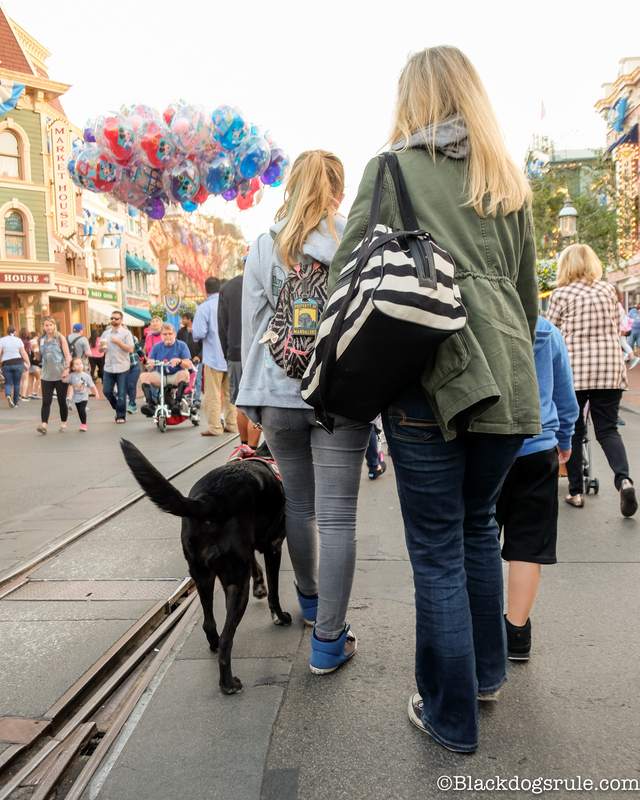 Making sure you carry water, a collapsible water bowl, boots for a really hot or really cold day, treats if used for training scenarios, waste bags, and in the case of a full day at Disneyland, food. It is easier to prevent a dog from ground surfing if after a 10-12 hour day full of activities, your dog has a full, content belly from her regular kibble. Just as a reminder, I want to caution you. 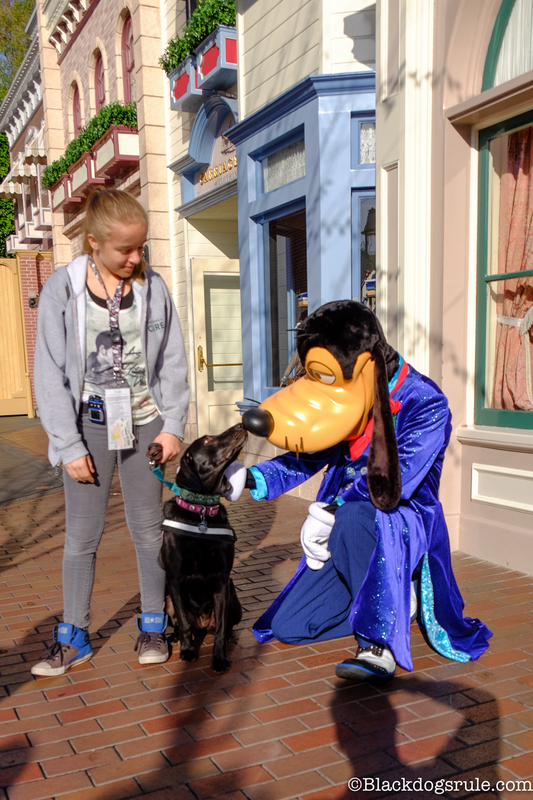 Disneyland is no place for a dog that hasn’t had a tremendous amount of work and training in public access. 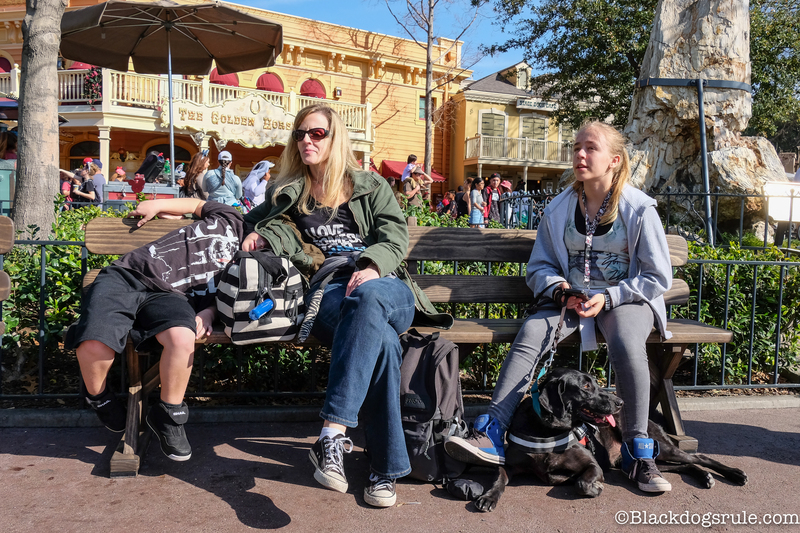 Without that base of training, a crowded day at Disneyland could be enough to ruin an otherwise perfectly fine dog. If you aren’t an experienced, assertive handler, or know how to properly read and assess your dog, leave them home for the day. Great great article! Lol, enjoyed the gun dog part! I can just see that happening….oh and I am guessing that was Major! Pictures are beautiful. 1. Did Raven really go on rides with you? 2. When working through distractions did you use food rewards or just verbal praise? The answer to the first question is yes. We took Raven on the Haunted Mansion, Buzz Lightyears Astro Blasters, Pirates of the Caribbean, and Small World. We have also had Major with us in the past on the Jungle Cruise and Autotopia. 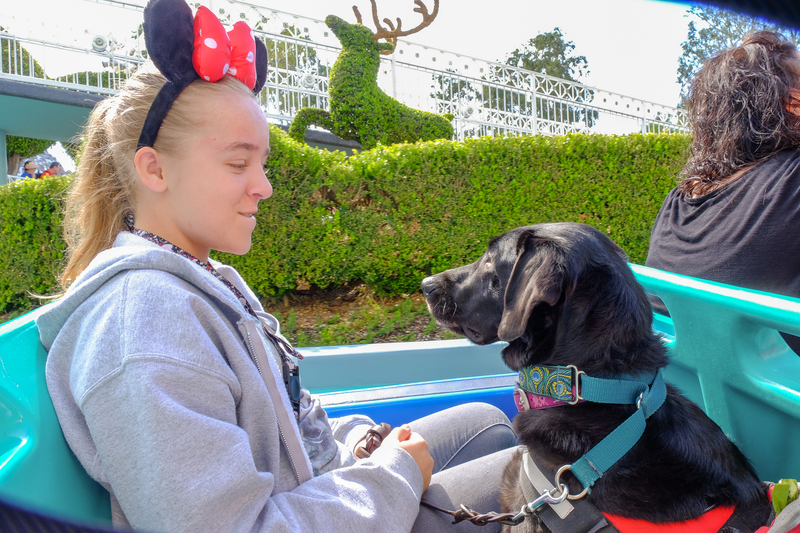 The dogs are allowed on many rides, and for the rides they can’t go on due to safety issues (roller coasters, Star Tours) Disneyland provides crates at each ride for you to safely leave your dog while you enjoy the attraction. In our case, my wife isn’t a fan of roller coasters, so she kept Raven with her while we rode. 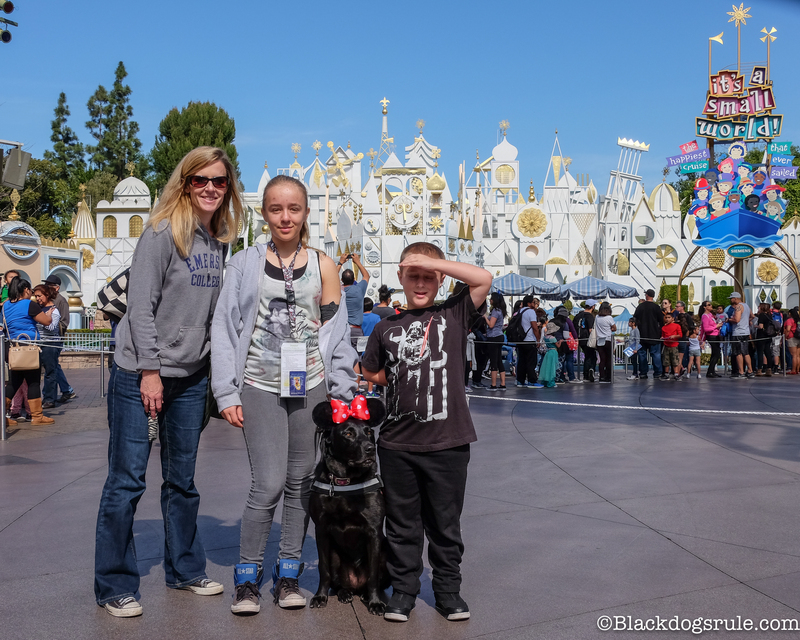 Disneyland also provides designated service dog restroom locations spread through out the park. Disney takes good care of it’s guests using SD’s. Thanks for sharing this experience and the great advice on protecting and providing for your DAD on a day-long excursion to a very crowded and stimulating venue! Thanks for this post. 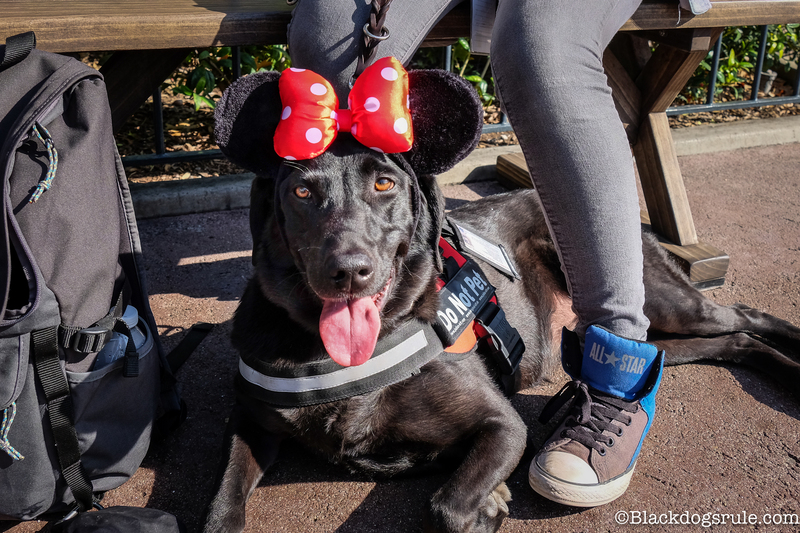 We’re going to WDW soon and taking my boyfriends diabetic service dog. SO it was great to read your post.